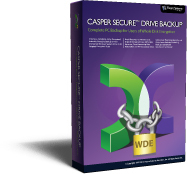 The Casper Restore-Point Backup and image file backup features are supported only when running on Windows 7 and later or when booting and running from the Casper Secure Startup Disk. The VHDX image file format is supported only when running on Windows 8 and later or when booting and running from a Casper Secure Startup Disk created with the Windows 8 or later ADK. Windows BitLocker Drive Encryption is currently supported only for drives using software encryption that have been formatted with the NTFS file system. BitLocker hardware encrypted drives and BitLocker encrypted drives that are formatted with the FAT file system can be copied only in their unencrypted state. Encrypted cloning and imaging is currently supported only for drives encrypted with software-based drive encryption. Self-encrypting drives (SED), including Opal compliant and Windows BitLocker eDrive compliant drives, may be copied in their encrypted state only when software encrypted. Booting from a USB hard drive requires a computer with BIOS/UEFI firmware support for booting from USB hard disk drive type (USB-HDD) devices. Not all computers support booting and running from USB hard disk drive type devices. Some computers equipped with both USB 3.0 and USB 2.0 ports will support booting only when the device is connected to a USB 2.0 port.